One way the federal government could help reduce Black-on-Black crime and address the nation’s poverty crisis would be to start telling the truth about unemployment. 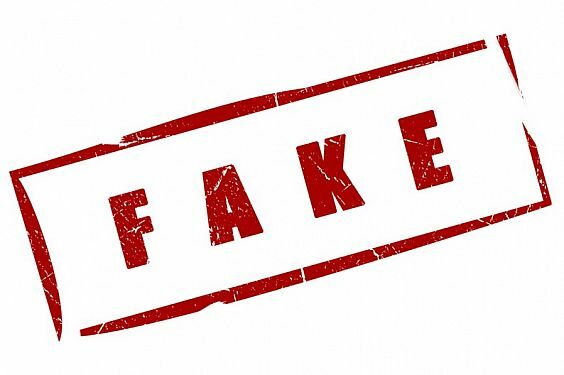 The U.S. Bureau of Labor Statistics (BLS) publishes a set of completely phony statistics each and every month, in order to convince the public that our economic condition is rosier than it appears. However, if the economy is doing so well, then why has the number of Americans living in poverty recently spiked to levels not seen since the mid-1960s? What’s up with that? Could it be that the employment situation and more specifically Black unemployment is far worse than government statistics portend? For example, in December 2009, the BLS estimated that the official unemployment rate in Detroit, Michigan was 27.0%. However, at the same time, Detroit Mayor Dave Bing stated that the city’s official unemployment rate was as believable as Santa Claus, proffering that it was instead closer to 50.0%. Considering that less than four years later, Detroit would file the largest municipal bankruptcy in U.S. history, he was probably on the right track. So how did Mayor Bing come up with his figure? Well, the BLS estimated that for the year ending September 2009, the State of Michigan’s official unemployment rate was 12.6%, but according to its broadest definition of unemployment, the state unemployment rate was 20.9%, or 66.0% higher than the official rate. Therefore, since the City of Detroit’s official unemployment rate for October 2009 was 27.0%, applying the broader rate meant the city’s rate was really as high as 44.8% (27.0 * 1.66). Since Mayor Bing’s estimate was more in the ballpark than the BLS, it might be a good idea to apply this same logic nationwide, especially when it comes to Black Americans, who as a whole have traditionally sustained the nation’s worst levels of unemployment. Every month, the BLS publishes its official U-3 unemployment rate, a headline number that almost everyone is familiar with, but also releases the lesser known U-6 unemployment rate, its broadest measure of unemployment. U-6 includes short-term discouraged and other marginally-attached workers as well as those forced to work part-time because they cannot find full-time work. When we compare current BLS statistics, which are based on a flawed methodology only in place post-1993, against its pre-1994 methodology, we discover that the official U-3 rate is really closer to 12.8%, not the 7.4% figure published on August 2, 2013, and that the broader U-6 rate is really closer to 23.3%, rather than 14.0%. There is actually an alternative to the federal government’s phony reporting. A private organization, Shadow Government Statistics, publishes a more accurate measure of unemployment, which is based on pre-1994 BLS methodology. The seasonally-adjusted SGS Alternate Unemployment Rate reflects current unemployment reporting methodology adjusted for SGS-estimated long-term discouraged workers, who were defined out of official existence in 1994. In other words, the SGS Alternate Rate adds millions of long-term discouraged workers back to the BLS estimate, which only includes short-term discouraged workers. In case you didn’t catch that, allow me to clarify. What this means is the BLS has eliminated long-term discouraged workers (i.e. those who have been without a job for so long, they haven’t bothered to look for more than 12 months) from official unemployment statistics since 1994, thus distorting the real employment situation. And herein lies the problem: If you knew that a U.S. city was battling an unemployment rate of 27.0%, while the federal government was busy creating jobs in Egypt, China and everywhere else but that city, what would that tell you? Would it have made any difference if you knew that city’s unemployment rate was really 44.8% or greater? What do you think millions of long-term discouraged workers are up to, just sitting around laughing, joking and waiting on a government handout? Not likely, for an idle mind is the devil’s workshop. To get a better idea of what’s really going on in America, we will begin by analyzing the federal government’s broadest measure of unemployment (U-6). Then we will compute the difference between U-6 and Shadow Government Statistics Alternate Unemployment Rate (Real U-6). Next, we’ll analyze the government’s official U-3 unemployment rate, then use the difference between U-6 and Real U-6 to extrapolate the real official unemployment rate (Real U-3). Finally, we will focus on unemployment among Black Americans, and using the same formula, project the real unemployment rate for Black Americans. What’s the point? The first step in solving any problem is to define it. My mission today is to better define the problem, not necessarily solve it. There’s not a person in this nation, with the exception of those who still believe in Santa Claus, who truly believes the official unemployment rate is 7.4%, as of August 2, 2013, or that the total unemployment rate is just 14.0%. Nor is there any way on earth that Black folks, especially those in or around inner-cities, believe the Black unemployment rate is just 12.6%. So let’s get real. With that, here we go. By comparison, U-6 averaged between 8.2% and 10.6% in the six years prior to the Great Recession, including 2008, the first full year thereof, but since the end of 2008 has averaged between 14.1% and 16.7%. What does that tell you? It tells me that notwithstanding the fact that the Great Recession ended in June of 2009, a solid four years ago, the total unemployment rate in 2013 is averaging 33.0% higher than in it did at the end of 2008 ((14.1 – 10.6) / 10.6), the first full year of the recession. In other words, U-6 has grown 33.0% worse, since Potus 44 took the reigns, and that’s going by the government’s most optimistic estimates, based on a set of phony statistics which fail to count the number of long-term discouraged workers. Well, that’s not very encouraging. According to Shadow Government Statistics, the BLS has defined a certain segment of society, long-term discouraged workers, out of existence since 1994. It kind of sounds like the old three-fifths of a man theory, only now millions are counted as zero-fifths of a person, at least when it comes to official unemployment statistics. Oh you can vote alright, but if you’re poor, unemployed and haven’t searched for work in more than 12 month’s, you don’t really matter. Thus, the real unemployment rate is far worse than what the federal government would have us believe. The chart that follows is the latest from Shadow Government Statistics. 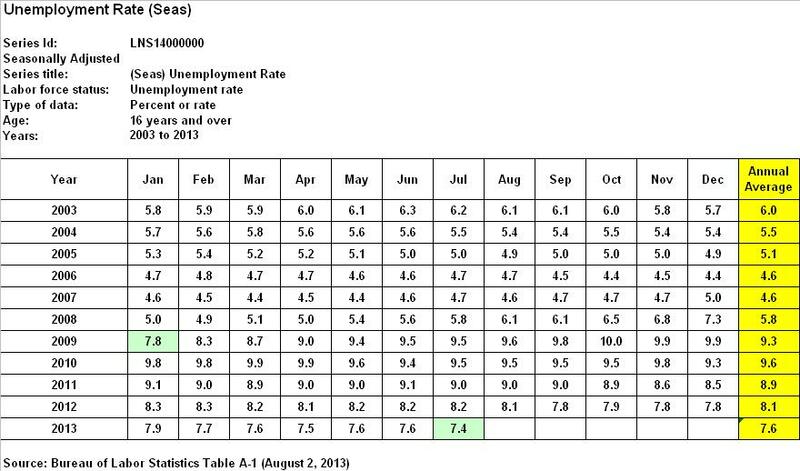 As you can see visually, and according to data from Shadow Government Statistics, for January 2009, instead of the federal government’s phony unemployment rates, U-3 of 7.8% and U-6 of 14.2%, real total unemployment (Real U-6) was actually 18.3%. But even more stunning is the fact that since January of 2009, instead of both rates peaking in 2009-2010 before declining to current BLS levels, Real U-6 has never declined, but has rather increased from 18.3% to 23.3%. Summary Conclusion 1: The U-6 unemployment rate is really closer to 23.3%. When compared to the BLS U-6 rate, Real U-6 was 28.8% higher for January 2009 than we were led to believe ((18.3 – 14.2) / 14.2). Also, instead of declining, Real U-6 has since increased by an additional 27.3% ((23.3 – 18.3) / 18.3). In other words, Real U-6 is currently 64.0% worse than the BLS reported for January 2009 ((23.3 – 14.2) / 14.2). Got that? By comparison, U-3 averaged between 4.6% and 6.0% in six years prior to the great recession, including 2008, the first full year thereof, but since the end of 2008 has averaged between 7.6% and 9.6%. Keeping in mind that the Great Recession officially commenced in December 2007 and ended in June of 2009, what does that tell you? It tells me that undeterred by the federal government’s phony statistics; U-3 is worse off today, on average, than after the first 13 month’s of the recession, which only lasted a total of 19 months. In other words, in contempt of the fact that the Great Recession ended in mid-2009, just over four years ago, the average U-3 unemployment rate in 2013 is 31.0% worse than at the end of 2008 ((7.6 – 5.8) / 5.8). Although bad enough on its lonesome, remember that this is based on the federal governments most optimistic estimates, steeped in the same phony methodology mentioned above. So then what is the real unemployment rate? Summary Conclusion 2: As shown in Summary Conclusion 1, the Real U-6 unemployment rate is currently 64.0% higher than the BLS reported for January 2009. Therefore, I contend that the real official unemployment rate (Real U-3) is also 64.0% greater than the government’s January 2009 figure. Since U-3 was said to be 7.8% for January 2009, Real U-3 is closer to 12.8% today (7.8 * 1.64). Are you still with me? Good. Now let’s look at the unemployment rate for Black Americans. By comparison, the official unemployment rate for Black Americans averaged between 8.3% and 10.8% in the six years prior the Great Recession, including 2008, the first full year thereof, but since the end of 2008 has averaged between 13.4% and 16.0%. Again, what does that tell you? It tells me that even though the Great Recession ended in mid-2009, more than 48 months ago, the average annual unemployment rate for Black Americans is now 32.6% worse than at the end of 2008 ((13.4 – 10.1) / 10.1). In other words, the official Black unemployment rate has grown worse by 32.6%, since Potus 44 took the reigns. Yet again, I remind you that these are the federal government’s most optimistic estimates, based on phony BLS methodology, as mentioned above. [It’s worth noting that the unemployment rate for Black Americans more closely mimics the U-6 rate, and is currently 70.2% higher than the official U-3 rate ((12.6 – 7.4) / 7.4).] So even after reducing millions of Blacks to zero-fifths of a person, for unemployment purposes, the Black unemployment situation is completely unacceptable. Summary Conclusion 3: As shown in Summary Conclusion 1, the Real U-6 unemployment rate is currently 64.0% higher than the BLS reported for January 2009. Therefore, I contend that the official unemployment rate for Black Americans is also 64.0% greater than the government’s January 2009 figure. Since the Black unemployment rate was reported to be 12.7% for January 2009, the official unemployment rate for Black Americans is really closer to 20.8% today (12.7 * 1.64), or 65.0% higher than BLS reported on August 2, 2013. But that’s not the end of the story. Now we must take into consideration Detroit Mayor Dave Bing’s 2009 assessment of Detroit’s real unemployment rate. When we apply Mayor Bing’s formula to the nation as a whole, we can draw the following conclusion. Conclusion: The official U-3 unemployment rate is really closer to 12.8%, as shown in Summary Conclusion 2. The total U-6 unemployment rate is really closer to 23.3%, as shown in Summary Conclusion 1, or 82.0% higher than Real U-3 ((23.3 – 12.8) / 12.8). Therefore, I contend that the total unemployment rate for Black Americans is also 82.0% higher than the figure shown in Summary Conclusion 3. Applying the broader measure means the unemployment rate for Black Americans is actually as high as 37.9% (20.8 * 1.82). The first step in solving any problem is to define it. Publishing phony employment statistics is just one of the many games slick talking Washington politicians play to hide the truth. By masking reality since 1994, the U.S. government has been outright lying to itself and the general public for at least two decades. So what else are they lying about? What about inflation, GDP, the money supply, and carbon dioxide levels in the atmosphere, to name a few? 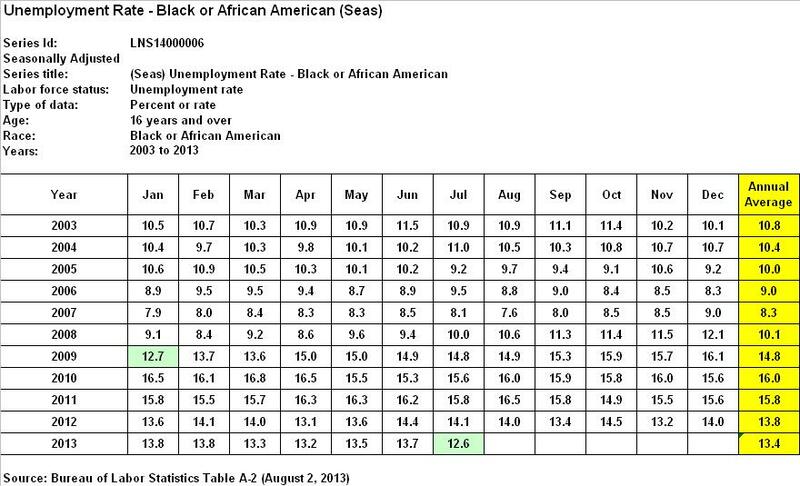 According to the federal government, as of July 2013, the official U-3 unemployment rate was 7.4%, U-6 total unemployment was 14.0%, and the official rate for Black Americans was 12.6%. But these are phony estimates, which fail to include the number of long-term discouraged workers. When we include those who should matter the most, those currently counted as zero-fifths of a person, we find that Real U-3 is 12.8%, Real U-6 is hovering at 23.3%, and the unemployment rate for Black Americans is really closer to 37.9%. Not only has the unemployment rate grown 64.0% worse since January 2009, for all Americans, but the unemployment rate for Black Americans is really closer to 37.9% nationwide. However, within more problematic, high-crime, urban areas across the nation, such as Detroit, Black unemployment is now deathly critical. If you want to know the real unemployment rate in your city, state or locality, take the federal government’s official rate from January 2009, multiply it by 1.64, then take the result and multiply it again by 1.82, and you’ll have a more accurate figure. When Potus 44 starts throwing around words like phony, as he prances around waving a golf club and berating folks for locking their car doors, he should be mindful that the very core of the government, over which he so arrogantly presides, may in fact be built on a lie. If Potus 44 truly believes the unemployment rate for Black Americans is 12.6%, then he should probably just take another nap, play another round of golf, give another incoherent speech, and then take another vacation. But if he believes the real unemployment rate for Blacks is closer to 37.9%, and construes it to be the main culprit behind poverty levels not seen since the mid-1960s, and a reason why 93% of Blacks are being murdered by other Blacks, then he should act accordingly. However, race-baiting, raising the minimum wage, hiking income taxes, regulating the coal industry out of existence, delaying the Keystone XL Pipeline, and mandating that every American buy health insurance are all policies which lead to fewer job opportunities, not more. So perhaps the solution to our problem lies not in government doing more, but in government undoing much of what it has already done. My mission today was not to solve America’s problems, but rather to help define them. It’s high time the federal government starts giving us the truth. Now here’s a riddle: Detroit has fallen! Detroit has fallen! How long before the United States faces bankruptcy? Confounded Interest – The Daunting Gap In Unemployment and Homeownership By Race – Blacks In Last Place. Crosslink via: Confounded Interest: The Daunting Gap In Unemployment and Homeownership By Race – Blacks In Last Place.